Survey with the cherry picker. The bronzed black kite that had fallen from the pedestal is evident at the bottom right. The damaged bronze adornment and top of the pedestal. The stone leaves blossoming from the pedestal’s center are barely restrained by a loosened bolt. Erected on the ruins of the keep of Sendai Castle (or Aoba Castle) in 1902, the Shochuhi memorial commemorates the fallen from the Imperial Army’s 2nd Division, which was located in Sendai. As was reported in January of this year, the memorial features a black kite in bronze atop a stone pedestal close to 20 m high that was damaged by the Great East Japan Earthquake last year (evident by the fall of the bronzed black kite). 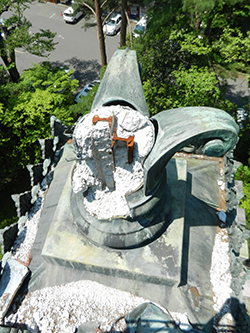 Following a survey of the damage and collection of fragments in January, damaged to the top of the pedestal was surveyed and fragments were collected with a cherry picker on June 26th as part of the Cultural Property Rescue Program. 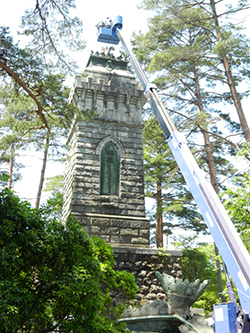 The survey and work to collect fragments included individuals from the Gokoku Shrine, Miyagi Pref., where the Shochuhi memorial is located, as well as Mitsuro MIKAMI (Miyagi Museum of Art) from the Council to Conserve Damaged Cultural Properties in Miyagi Prefecture, personnel from the Japan Institute for the Survey and Conservation of Outdoor Sculpture (a firm with experience surveying and conserving outdoor sculptures in Japan), and personnel from Hashimototen Co., Ltd. (a local construction firm). Also participating in the survey were Akio HASHIMOTO of the Department of Crafts, Faculty of Fine Arts, Tokyo University of the Arts and Chizuko YOSHIDA of the Educational Materials Office of the Faculty of Fine Arts, Tokyo University of the Arts. 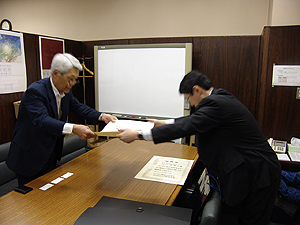 Work was supported by a donation from Kaikai Kiki Co., Ltd. to the National Research Institute for Cultural Properties, Tokyo to help with the Cultural Property Rescue Program. The survey found a number of bronze fragments scattered atop the pedestal, and these fragments were collected. A survey of the remaining portion of the bronze adornment determined that one of the stone leaves was barely restrained by a loosened bolt, cracks ran through the narrow portion of the base supporting the bronzed black kite, and the bronze adornment that was perched atop the pedestal had struck the projecting cornice at the top of the pedestal before leaving a hole at the foot of the pedestal when it fell. The stone leaves that had come free were secured with bands and the top of the pedestal was covered with blue plastic tarp, but these are only stop-gap measures. If a large earthquake were to strike again, the stone leaves could fall to the foot of the pedestal. Rainwater from holes in the cornice and the damaged pedestal could seep into the pedestal and cause it to collapse. Steps to deal with the bronzed black kite that had been left where it fell at the foot of the pedestal need to be devised along with steps for the future. 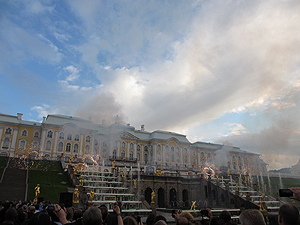 The 36th Session of the World Heritage Committee was held from June 24th to July 6th in Saint Petersburg, Russian Federation.Prior to the Committee, the Institute summarized and analyzed documents regarding the state of conservation of World Heritage properties and the Advisory Bodies’ evaluation of nominated properties. Three staff members of the Institute joined the Committee in collecting information. 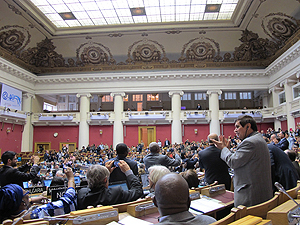 Twenty-six properties were inscribed on the World Heritage List during the session. Four properties that were slated to have their inscription deferred were instead inscribed on the list; this number was smaller than that during the previous session. Seven properties that were to be referred back to the state party for additional information were all inscribed on the List. Although there was less of a tendency for the Advisory Bodies’ recommendations to be overturned by the Committee due to changes in Committee Members as a result of elections,that tendency still remained. Three former mining sites were inscribed on the list, and all three were associated with negative aspects of history, like the spread of labor movements among miners and mining accidents. This tendency to focus on the dark side of the history remains evident. The World Heritage Convention is said to be UNESCO’s most successful convention since it has been ratified by 190 state parties. The Birthplace of Jesus: Church of the Nativity and the Pilgrimage Route, Bethlehem was inscribed on an emergency basis during the session. Of interest is the fact that the “state party” nominating the property was Palestine. In addition, World Heritage property in Mali was destroyed by Muslim fundamentalists, highlighting the global impact of the destruction of World Heritage properties. Since Palestine ratified the Convention last year, the United States stopped its financial contribution and Japan became the largest contributor to UNESCO. As of the current session, Japan also became a Committee Member with the right to comment freely during sessions, so Japan should be playing a larger role in future sessions. 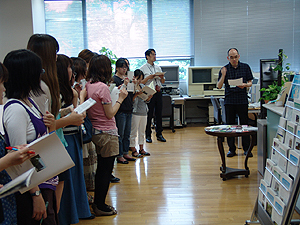 The Institute hopes to provide information to relevant organizations in Japan and to provide support such as information analysis so that Japan can contribute further to the World Heritage Committee. Kiyoshi YAMASHITA has been spoken of as a ‘National Artist’ that can create imagery that induces a sense of innocence and idyllic nostalgia since the second time he was noticed during the postwar period in the mid-1950s. In contrast, when he first gained prominence for two years between 1938 and 1940, from around one year after the outbreak of the Second Sino-Japanese War, he was portrayed as the ‘Japanese Van Gogh,’ who exemplified a magnificent creative faculty even while having a mental disability. It was a very interesting experiment that tried to analyze society from how visual representations were received, extending outside of the narrow framework of “art.” Ms. KANEKO returned to her home upon finishing her research here at the end of June. This research examined customs and folk techniques related to poles found in Sarawak State, Borneo from June 27th to July 4th. 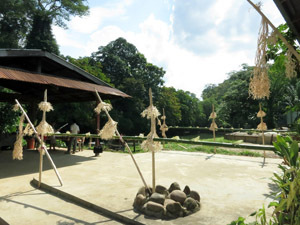 These poles resemble the Kezurikake, or half-shaved sticks, found in Japan. In the Japanese Archipelago, Kezurikake are widely used as ritual implement or as decorations during Ko-syogatu, or the New Year according to the lunar calendar, or as Inau, a ritual implement of the greatest importance to the Ainu people. Although similar poles were known to be found in Borneo, there have been almost no field studies or comparative studies of these poles by experts. Thus, preliminary research was conducted in cooperation with experts from the Center for Ainu & Indigenous Studies, Hokkaido University in order to facilitate future comparative studies. The research site provided several opportunities to talk with local residents and observe their creation of these poles. A rough outline of customs related to these poles was also obtained. The names, uses, forms, and materials of these poles differ slightly depending on the tribe. 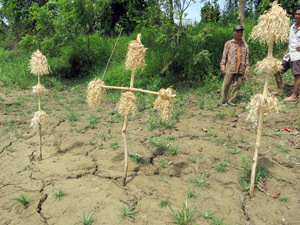 The Iban people, for example, call these poles Bungai Jaraw (Bungai means“flower”). Nowadays, these poles are typically considered a decoration to welcome “VIPs.” However, there is some evidence that these poles had greater symbolic or religious meaning since they played an important role in headhunting and during traditional festivals. More in-depth research is needed. Plans are to study Kezurikake-like poles in countries like Borneo in order to better understanding the customs related to Kezurikake in Japan and techniques for their fabrication. 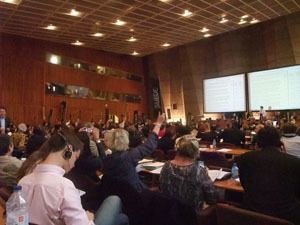 The 4th session of the General Assembly took place from June 4 to 8, 2012 at UNESCO Headquarters, Paris. 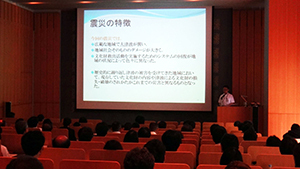 Representing the Institute, MIYATA Shigeyuki participated in the conference. The main subject for discussion during the session was revision of the Operational Directives, which led to a more lively discussion among representatives from participating nations than takes place at a usual session. Past sessions approved the decisions of the Intergovernmental Committee, but the current session turned into a discussion, much like the Intergovernmental Committee. Revision of the way in which nominations for inscription on the Representative List are evaluated was a matter of intense debate. The question was whether to change from evaluation of nominations by the Subsidiary Body, with extensive advice from the Intergovernmental Committee, to evaluation by the Consultative Body, which is comprised of experts like those tasked with considering nominations for the Urgent Safeguarding List. 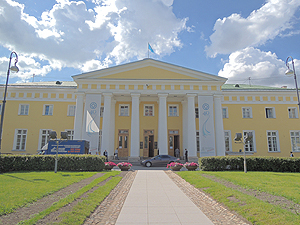 In the end, the present method of nominations evaluated by the Subsidiary body was retained, with revision of recommendations from the Committee. Decisions that will greatly affect the implementation of convention were made, e.g. the maximum ceiling of files to be evaluated annually by the Committee, a long-running concern, was formally defined in the Operational Directives. Although the Assembly still has supreme decision-making ability with regard to the Convention, this session was the first to completely overturn the recommendations of the Committee, and problems with implementation of the Convention remain. In addition, the appearance of divergent opinions among different regional groups must be followed closely. Since Assembly sessions have increasingly become a forum for discussion, this trend must be followed closely in the future. Follow-up Training for Conservators is conducted annually to inform individuals who have completed the Training for Museum and Art Museum Conservators of the latest findings in conservation. With 80 participants in attendance, follow-up training of this year was held on July 25. As noted below, the first half of follow-up training covered efforts by the Committee to Rescue Cultural Properties Damaged by the Tohoku Earthquake and Tsunami (Cultural Property Rescue Program) thus far. The second half covered approaches to dealing with conservation conditions by Institute personnel. Each year, at least 10% of all individuals who have completed the training for conservators attend to follow-up training. This reflects the Institute’s hopes for better approaches to conservation conditions. The Institute will continue its efforts to accurately ascertain conservation needs in order to meet its expectations. In a collaborative project with the Institute of History, Archeology, and Ethnography of the Academy of Sciences of Tajikistan, the National Research Institute for Cultural Properties, Tokyo has undertaken conservation of the wall paintings in the National Museum of Antiquities of Tajikistan since 2008. A Seminar on ‘the Conservation of Wall Painting Fragments in the National Museum of Antiquities of Tajikistan’ was held on June 12, 2012. Conservation experts described about the conservation efforts thus far. The wall paintings that are being conserved are mostly those that were excavated from the palace ruins (from around the 7th–8th century) of the Sogdian people, who were known to be merchants on the Silk Road, and those that were excavated at the palace ruins at the Khulbuk site dating from the early Islamic period (from around the 11th–12th century). The Sogdian wall paintings were burnt and fragmented. At the seminar, the experts talked about conservation techniques such as those to put the fragments together and display them in the Museum of Antiquities. The wall paintings excavated at the Khulbuk site are extremely fragile. 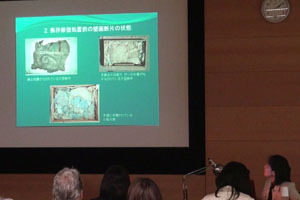 Therefore, experts spoke about current conservation efforts to consolidate the fragments and conservation techniques for display of those fragments in the future. 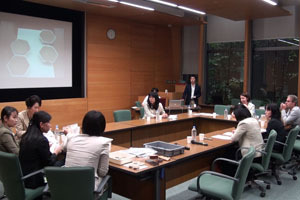 The seminar featured presentations on techniques and materials for the conservation of wall paintings and discussions by participants, providing a forum for a meaningful exchange of opinions.